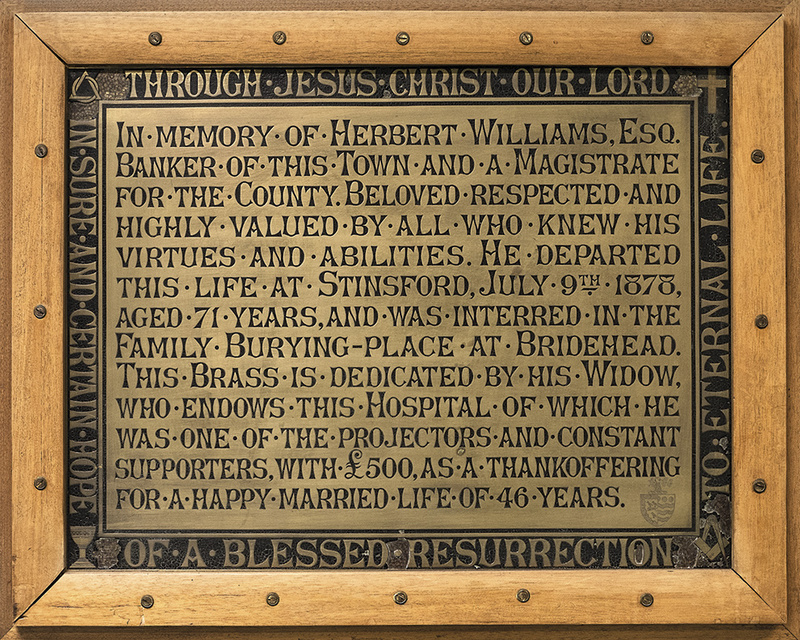 On 9 April 1862 Walter Kerr Hamilton, the Bishop of Salisbury, dedicated a permanent chapel at the hospital. 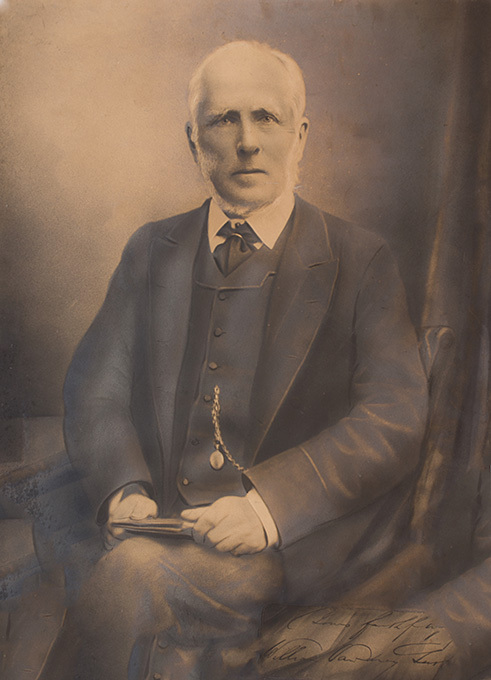 The new building was financed by Robert Williams junior, son of the original donor of the site on which the hospital had been built more than twenty years before. When the hospital opened in 1841 one of the rooms in the building was used as a makeshift chapel. In 1848 the chairman of management committee, Arthur Acland, presented the hospital with a wooden chapel which had previously been attached to his house in Dorchester. He made the donation as he was leaving the area, having inherited a relative’s estate (it is at this time that he changed his surname to Troyte). According to William George Bacot, who was house surgeon from 1852 to 1858, the wooden structure was erected outside “the first landing, at the top of the first flight of stone stairs. The door opened from the landing, directly into the Chapel, which was supported on stone pillars, and thus made a sort of open portico over the back door”. 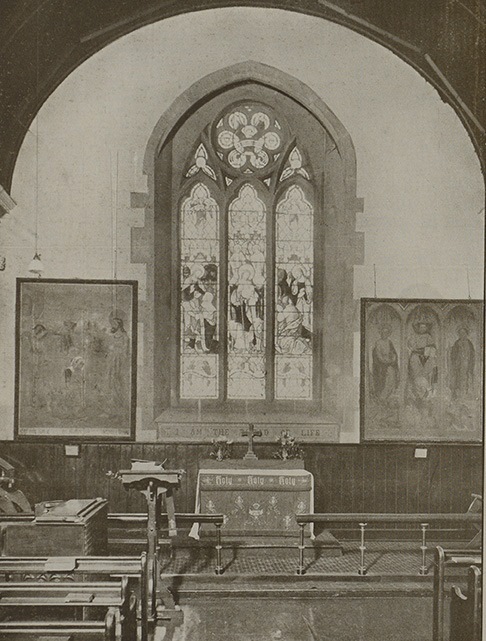 The work on the new chapel was carried out by Dorchester builder John Wellspring, from original designs by Benjamin Ferrey. The new structure was attached to the north-east corner of the hospital building, as a continuation of the Bankes wing. Afterwards the Bishop – “an indefatigable preacher” – gave a sermon based on Matthew 8, verse 17 “Himself took our infirmities and bare our sicknesses”. He then offered up prayers of dedication and asked for Divine blessing on the founder and his family, and the service was brought to a close with the benediction. Other commemorative tablets were lost when the chapel was demolished after the hospital’s closure in the 1990s. Luckily Patrick Rimmer, of the hospital’s estates department, had the foresight to record the wording and I am grateful to him for supplying these. 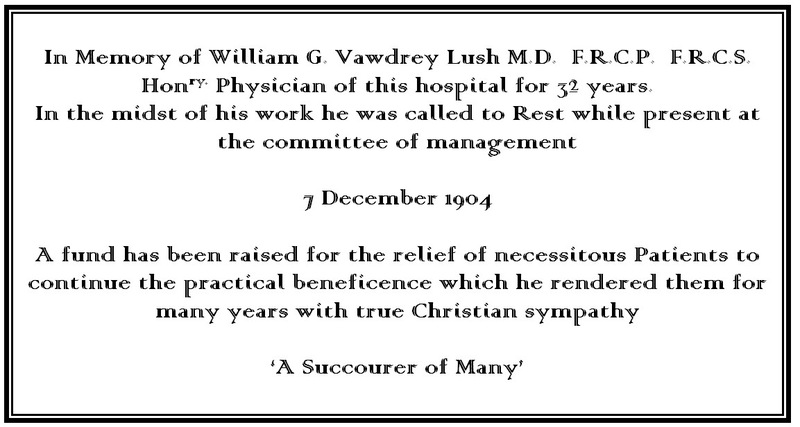 One marks the death of Dr. William Vawdry Lush during a management committee meeting at the hospital. our Lord’s love and care for His people, under the similitude of the ‘Good Shepherd’; the side lights are intended to draw attention to two great Christian virtues especially necessary for inmates of a hospital, viz. : Faith and Thankfulness ; while at the head of window is seen an Angel bearing a scroll with the blessed message to those who work for the poor and afflicted – “Inasmuch as ye have done it unto one of the least of these My brethren ye have done it unto Me”. Sources: H. P. Liddon, Walter Kerr Hamilton, Bishop of Salisbury, A Sketch …., 1869, 2nd edition, London: Rivingtons; Salisbury and Winchester Journal, 12 April 1862, page 4; John Acland, A Short History of the Dorset County Hospital, 1902, pages 14-17.